I graduated from college in 1972. It was a time when, if you wanted to be a doctor, you started the journey as a high school student and looked at college as a stepping-stone to medical school. Back then, going into medicine was considered a primary choice, a “calling”. That was the culture of the times going back to Hippocrates. You chose a “Pre-med” course for college, which was skewed towards the sciences. The medical schools had college course requirements you had to fulfill before applying. You already had your list of preferred medical schools before you were a junior in college. By the way, most college students completed their college studies in 4 years back then. If you didn’t you were considered a slacker or deficient in some way. More than 4 years in college on a medical school application was likely to get you an immediate rejection. Most medical schools would immediately reject anyone over 27 years old. You had to do well on the MCATs (Medical College Admission Test). You had to get stellar recommendations from your college professors and the college’s guidance office. When you interviewed, you had to prove you were “called”, that being a physician came first in your life. Everything else took second place. Intelligence wasn’t enough since the applicants were within a narrow intellectual bandwidth. 1. I was 27 when I applied to Medical School and was rejected from several only because of my age (they weren’t afraid to tell you this). I asked one what the rationale was for this and the answer was, a large proportion of medical school costs were paid for by government subsidies and if you were older than 27, you didn’t spend enough years in practice to “pay that back” in taxes. Really? 2. A fellow I knew, who only got into one medical school, went to college to become a Medical Technologist (people who run the tests in a hospital laboratory) because he thought it would give him a better chance of getting into medical school since he would learn a lot about all of those tests and how they related to diseases. When he interviewed at medical schools they told him they weren’t likely to be interested in him because Medical Technologist was a “dead end” career and they didn’t want people in the school who had set their career sights so low. Really, they told him this! When you got into medical school, on the first day they reminded you that many, many applicants would be thrilled to be in your place, that they felt “called”. If you didn’t commit to your patients coming first in your life, you might as well get up and leave now, there were plenty of others with that commitment who could fill your seat. Where I went to medical school, there were 70 applicants for every accepted student. Nobody got up and left. Medical school was grueling. Between actual class hours (8 hours a day) during the first two years, and studying and reading tomorrows reading assignment until 10-11:00 at night, you were putting in a good 60 hours a week right from the get go. This got even higher when you got into the clinical rotations because you basically shadowed an intern, you were on call with them, you went to bed when they went to bed, etc. That was up to 100 hours a week for clinical floor work (regular hospital wards), then there was 36 on, 12 off for 6 weeks twice a year for ICU/CCU (126 hours a week) and then 28 on, 20 off for ED for 6 weeks twice a year (98 hours a week). You also got these hours as an intern and resident for three more years. You never had the expectation that you would be working a 40-hour week when you got out into practice. Back in the 1980’s and 1990’s the average Internist worked 60-80 hours a week. Primary care was on the 80 hour end. At the same time, you were making 2-3 times the income everyone else in your neighborhood was. And there were (and are) careers where 80 hours was pretty normal but they made (and still make) half of what you made. My medical school class graduated in 1979. This was the last class where just about everyone went into medicine as a calling. Beginning in 1980, it became apparent to me that there was a sea change starting. The students graduating in 1980 were generally born in 1955 or later. There were occurrences I personally experienced that foretold the phenomenon I am going to discuss in this post. Here are two examples. When we were students, if an intern, resident or attending physician asked any of us to do something extra that would require more accountability than usual for a medical student, that would get you bragging rights! You never turned this down! You would be “da bomb” for days! Here’s what happened in 1980 that made me suspicious that things were changing. I was the intern on the ICU/CCU medicine team (there was also a surgical team) along with a resident. Just the two of us were on call. The entire team was two interns and two residents who alternated nights on call. It was early in the morning, like, 1:00 AM. We were slammed. Both the ICU and CCU were full. We got a call from the ED that an acute heart attack patient had presented to the ED and we had to take him. We couldn’t transport him. In these cases, we got busy looking over the charts of all of the patients in the ICU/CCU to see if anyone was stable enough to move to the floor to make room for the new critical patient. We found a patient 3 days post a heart attack. He was a VA eligible man. He still needed CCU care but was stable enough to be transported to the VA hospital about 8 miles away. We called the VA and they had a CCU bed available. Given that this was a CCU to CCU transport, the attending physician advised us that more than an EMT had to be in the ambulance. There weren’t any paramedics on the ambulances. The attending and the resident felt that neither myself (the intern) nor the resident could accompany the patient to the VA because the patients in the units needed our attention. The attending suggested that we have the medical student accompany the patient in the ambulance. I can tell you, if anyone in my class was asked to do this, there would be mucho boasting in the intern/resident’s quarters at lunch the next day! It would be the talk of the house staff for at least for a day or two. We thought this would be a great opportunity for our medical student! The resident had to order him to do it, at which point he sulked around for two days. There’s a process at the end of medical school called “The Match”. This process starts a year before graduation. You investigate training programs in the field you want to enter and line up interviews at those residency training programs. If you get invited, you spend a day at each program for a day-long formal interview session. After you’ve competed these, you make a list in order of your preference of the programs you would like to attend. Most students have 4-8 programs on their lists. At the same time, the programs make a list of the students they want to attend their program in order of their preference. During “Match Week”, a computer calculates the best alignment of which program you ranked against the lists of the programs who listed you in their order of preference. You are told you are going to the program with the best alignment of these lists (your one list against the 4-8 lists of the programs where you interviewed). On Match Day, you get a sealed envelope with the result and you must report to the one and only one program identified on the sheet of paper in the envelope. There are elated students and completely depressed students depending on how high on your list your assigned program matched. Then there is a big party that night to either celebrate or drown your sorrows, again, depending on where on your list the name of the program you were matched to was. The students in the classes at my medical school before 1980 looked at the prestige of the program, the types of things you would be exposed to, the elective opportunities, what procedures you were allowed to learn and do, the types of cases the hospital saw, etc. We tried to pick the programs where we would get the best preparation for being out on our own when we graduated the program. I was particularly interested in this as I was going into the National Health Service Corps and would be “out in the middle of nowhere” with little peer support or mentors. For the medical school graduating class of 1981, this changed. Each hospital ward had a room called the “call room”. This was where the attending, residents and students met first thing in the morning, did sign outs at 4:00 each day and met to discuss cases during the day. One day, around 3 o’clock in the afternoon, I was approaching the call room to get ready for sign out and I stopped in the door as a half dozen students were in there talking. What they were talking about was The Match. They were discussing where they had interviewed and were telling each other which programs they were ranking high on their list and why. To a one, they were ranking the programs on: 1. The number of days on call a month (the less number of days on call, the higher the rank), and the number and type of services the program had that took work off of the intern/resident’s plate (did they have a 24/7 IV team? 24/7 blood draw team? 24/7 blood gas team?) The more services, the higher on the list. You see, we had none of these where I trained. We had to put in IVs, draw blood, do blood gases on our patients and, at night when on call, for all of the team’s patients. You might think having these services was a good thing, but, in the middle of an emergency situation (like a code blue), you, the doctor, are looked to to get done whatever needs to get done. If you are not proficient in doing them, and no one else there can do them, it affects the patient’s outcome. I’ll give you an example of this. I was in the hospital. A patient was crashing. It wasn’t my patient. I ran to the room to help out. The nurses and a respiratory tech were working on the patient. The patient needed a blood gas pronto to correctly manage the patient. The respiratory tech was tasked with getting the blood gas. She tried 3 times and couldn’t get it. I told her, “Give me the set-up, I’ll get the blood gas”. She looked at me and said, “I’ve never met a doctor who could get a blood gas.” I said, “Please give me the set-up.” I got the blood gas the first time. The respiratory tech was shocked, but appreciative! This observance of medical students choosing the program with the least work was the beginning of the slide from medicine as a calling and medicine as a job. There are many studies documenting this shift. Some attribute it as a generational attitude. It’s basically this: Physicians graduating from Medical School after 1980 place their lifestyle first, being a doctor is second. The less they need to do the better. They will do things like go part time and take a lower salary to support their non-work (lifestyle) preferences. In a 2015 physician survey reported by the American Medical Association, 22% of male physicians and 44% of female physicians are part time (2015), up from 7% male and 29% female in 2005. “Twenty percent of male and 23% of female physicians in practices of 500 or more doctors worked part time. Meanwhile, only 6% of male and 4% of female physicians in practices of three to 50 physicians worked part time. In hospital-based practices, the total working part time was 5% of male and 7% of female physicians. 75% of groups in 2011 offered a four-day workweek, and 30% allowed job-sharing. The drive toward part-time medical practice is believed to be partially due to the fact that many more physicians are women of childbearing age looking to balance work and family life. ” (amednews.com) FYI, in 2016 49.8% of medical school graduates were women. And the men also want lifestyle over work. It’s not just a women’s thing. It’s the generation. Want to know why we need more physicians? 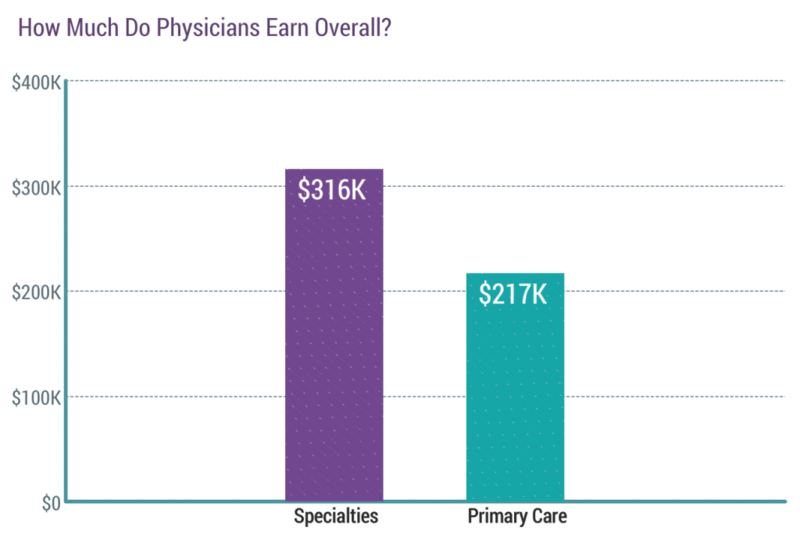 By the way it costs just as much to train a physician who goes part time as a full time physician, and your tax dollars pay a significant portion of medical school and post graduate training. It effectively lowers the total number of FTE (Full Time Equivalents = a person working 40 hours a week) of physicians coming out of medical training, compounding the problem of increased physician capacity need. But hey, these folks need their lifestyle, patients don’t need their medical care, right? Today’s physicians also want set hours in which to work so they can come and go to work on a set schedule. When the end hour of their shift comes they want to leave, no matter what is going on. They do not want work to interfere with the rest of their life. They want to hand off any ongoing cases to someone else at the end of their “shift”. In primary care this is “Go to Urgent Care” or “Go to the Emergency Room”. Shift work fulfills their desire. They also want a very predictable day. They have a low threshold to send their patients to Urgent Care or the ED rather than accommodate them into their schedule so their day doesn’t get “disrupted”. Thus the rise in the last decade of Urgent Care Centers. Remember, these failed in the 1980’s (see another post on my site about this, The Fracturing of the Health Care System). I worked in an Urgent Care Center for the last 5 years of my career. This was a prevalent comment from patients…”My doctor’s office told me to go to urgent care”. In the 1980’s and 90’s we would never say this to a patient, we would squeeze them in or have slots in our schedules to accommodate these folks. It’s 4:30 and I’m in the Urgent Care Center. An APC (Advance Practice Clinician) gets the next patient, who is still at the nurse intake station. The APC is called over there by the nurse and comes back saying the patient needs to go to the ED. The nurse is right behind the APC saying, “Are you sure we can’t do something here?” I asked what was gong on. The APC starts complaining that the patient had an orthopedic procedure on his left arm the day before and the patient’s arm is extremely painful. He called the Orthopedic office and they told him to go to urgent care. The APC is totally pissed off that the orthopedist wouldn’t see the patient and sent him to urgent care. She doesn’t want to touch the arm. The APC started filling out the ED transfer sheet. I asked the nurse if I could see the patient. He was sitting in a chair moaning. He had a bivalve cast with an Ace wrap around it. His fingers were cool and bluish. I told the nurse I could try something that I was pretty sure would work and personally took the patient to an empty room. What I perceived the problem to be was, his arm swelled between the surgery the day before and now and the cast was causing significant pressure on the arm impeding blood flow. Since he had a bivalve cast (the cast was in two pieces wrapped together), I determined I could just unwrap the Ace bandage and re-wrap it looser than before, but still firm enough to support the arm. So, that’s what I did. It took me five minutes. The patient had immediate relief and left the Urgent Care Center singing my praises. OK, I was a hero, but, his orthopedist or his nurse could have done the same thing, and actually the orthopedist was ethically obligated to do it because: 1. He did the surgery and was accountable for its outcome and, 2. He was already paid for it! And it took only five minutes!! Here’s more related to shift work and not disrupting schedules. I’m the Medical Director of a Staff Model HMO (all physicians are salaried with no productivity incentive). I’m at home at 6:00 PM and I get a call from our Urgent Care Department. The Physician Assistant there was upset and wanted me to know about a case. A patient had presented to one of our outlying clinics, about 12 miles from our main site which housed our Urgent Care Department. He was complaining of chest pain. Now, chest pain is a diagnosis where you do an immediate assessment to make sure a patient isn’t having a heart attack or something else as life threatening (Pulmonary embolism, dissecting thoracic aorta, etc.). It was 4:45 PM. The only physician left in the clinic was a female internist. The nurse came back to the physician’s office to tell her this patient was at the front desk complaining of chest pain. The physician told the nurse to tell the patient to drive to Urgent Care 12 miles away because SHE HAD A NAIL APPOINTMENT at which point she left without seeing the patient. The man could have died on the way to Urgent Care. Here’s one about not wanting the day disrupted. I was the Medical Director of the same Staff Model HMO. I had set up a system where I saw same day patients at every clinic in the Staff Model one half a day a week on a rotating basis. This way, I kept up my clinical skills and I got to know the staff and the systems at each clinic. I had let everyone know that patient care was more important than administrative meetings, so, at times when a clinic was unexpectedly short staffed, I cancelled all of my meetings and would go to the short staffed clinic to see patients. One Monday I got a call from a clinic where one physician was on vacation, another was at a conference and one of the two remaining physicians called in sick. That left only one physician at the clinic. I quickly told my secretary to cancel all of my meetings; I was on my way to see the scheduled patients of the sick physician. Now, I had already been in four medical groups doing primary care. My usual schedule was to go to the hospital at 6:30 AM, see my inpatients and make it back to clinic by 8:00 AM to see my office patients. My morning schedule was 15 minute appointments (or 30 minutes for a physical exam) from 8:00-11:45 AM and the same in the afternoon from 1:00-4:45 PM. Since this was the case in four groups, I figured this was normal. I got to the clinic to start my day seeing patients. I noticed in the schedule for the morning and afternoon that there were two 15 minute slots in each session labeled “phone time”. I asked the nurse what this was. She said it was time set aside for the doctors to return phone calls. This seemed odd to me, but I let it go. I saw two patients, then went to the door of the exam room with the third patient. I was looking at the chart. Just as I was about to open the exam room door, the nurse approached me and said a home health nurse called and was worried that a man with a double knee replacement, who had just been released from the hospital the day before, might have blood clots in his legs. He was on blood thinners but his legs were really swollen. I told the nurse to have him come in to be seen. She asked me when. I said, “Just have him come in, I’ll see him when he gets here.” She asked me again, when? I said, “Have him come in now, I’ll see him when he gets here. Put him in the procedure room and let me know when he gets there.” Blood clots are a serious problem, the sooner you figure things out, the better for the patient. My suspicion was, the physicians in this clinic didn’t squeeze patients into their schedule between scheduled patients, only into open slots no matter where they were. I had no morning slots in my schedule. I kept seeing patients. Two patients later, I’m again at an exam room door getting ready to see a man complaining of shoulder pain. The nurse comes up to me and says the knee replacement patient is in the procedure room. I returned the shoulder pain patient’s chart into the rack by the exam room door and ran down to the procedure room. I asked the patient and the home health nurse some pertinent questions and examined the patient. He had swelling but no other clear-cut signs of blood clots. I ordered a test to make sure his blood thinner level was adequate and went back to see the man with shoulder pain. The entire encounter with the knee replacement patient took about 8 minutes. To my surprise, the shoulder pain patient was gone and his chart was gone. I asked the nurse what happened to the patient and she said, “Since you saw the man with the knee replacements when you were scheduled to see the shoulder pain patient, I asked the shoulder pain patient to re-schedule.” WHAT!??!! I asked the nurse where the man was now. She said at the front desk re-scheduling. I ran out to the front desk, grabbed the patient and his chart, brought him back to the exam room and treated him. My guess was, making patients re-schedule in situations like this was normal in this clinic. Doing this fixed the total number of patients seen in a day. A couple of patients later, the test for the knee replacement patient came back and was therapeutic, so I discharged him and gave instructions to the home health nurse. That took about 3 minutes. Now I’ve finished the morning schedule, I’m charting with one hand and eating a sandwich with the other. (I quickly learned I should always bring my lunch to work because, as a physician, you never knew what was going to happen and you could go hungry!) The nurse brought in my afternoon schedule. To my astonishment, the man with the knee replacements was on my afternoon schedule at 3:00. I ran out and asked the nurse if the knee replacement man had called and was having more problems and needed to be seen again. To my…I’ll call it horror…she said, “Oh no, that’s to give you catch up time.” I said, “Catch up time?” She said, “Yes, here, if a doctor sees a non-scheduled patient we put their name in another empty slot so the doctor can catch up.” Really? In a session that started an hour after the “offending” session had ended? It was another way for the doctors to fix the total number of patients in their schedule. This on top of an hour of phone time built in their schedules. Believe it or not, the phone time slots became a standard with the new generation of physicians everywhere I went after that. In the above case, I could have seen five more patients had there been no phone or catch up time. 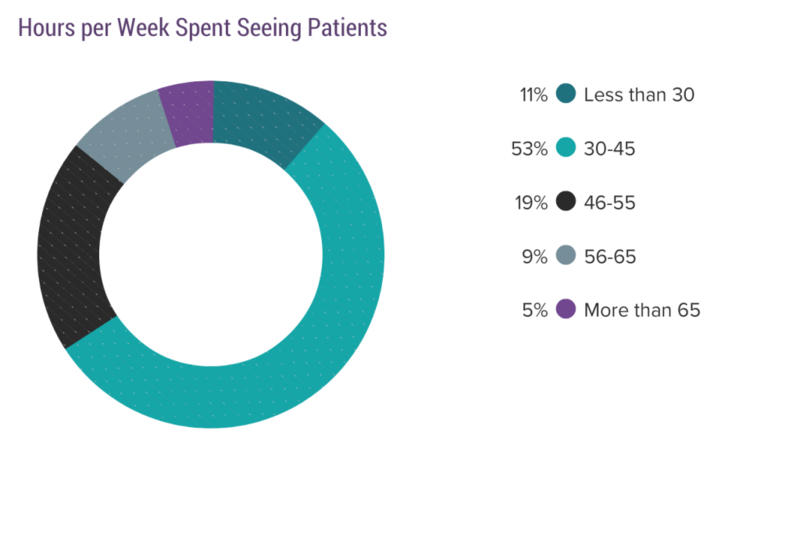 That’s about 25% of an average primary care physician’s daily productivity (They are supposed to see at least 20 patients a day). Want to know why we need more doctors? This is the consequence of the new generation of doctors. The orthopedist’s shift was about over, he didn’t want his day disrupted…send the patient to urgent care. Who cares about the patient’s lifestyle, convenience or pain? The doctor’s lifestyle overrules! Ethics? What’s that? And it didn’t impact the orthopedist’s pocketbook. He’s paid already! The primary care physicians were salaried and manipulated their schedules to minimize the number of patients they saw and they didn’t want their shifts extended by walk-ins even with potentially life-threatening conditions. Because of the low threshold for today’s physicians and APC’s to send patients to Urgent Care Centers, there are now ~9000 successful Urgent Care Centers in the US (Urgent Care Assoc. of America website). Primary Care Physicians in most practices only work four and a half days a week. They see patients for 32-36 hours in 4.5 days. If they worked 5 days and saw patients for 40 hours, you could immediately increase the physician capacity by 10%. An overnight fix. The sacred cow that physicians need at least a half-day off is a residual of the “old days” when PCPs went everywhere the patient went (hospital, skilled nursing facility, nursing home, emergency room, etc.) You needed time to see the patients in facilities other than the hospital, you had hospital obligations (you were required to sit on at least one hospital committee, you had chart work at the hospital, etc.). Today’s PCPs don’t do any of these. Why do they need a half-day off? The rest of the clinic staff doesn’t and they don’t get paid as well. Primary Care Physicians complain about the insurance companies “forcing” them to see more and more patients. However, in more than one medical group I practiced in, there were PCPs who scheduled patients every 30 minutes. Really? That would fix the number of patients seen to 16 a day if they actually saw patients 8 hours a day, and that’s with no no-shows/cancellations. And they still sent their call-ins to Urgent care. The group had allowed the physicians to decide how long they would see patients. The vast majority of PCPs were 20 or 30 minutes per patient. When I practiced full time, the medical groups required you to see more patients than that. In this group, they finally calculated that a physician seeing a patient every 30 minutes couldn’t support the cost of the overhead required to support the physician FTE. The group began a program that penalized physicians who couldn’t or wouldn’t meet a benchmark based on MGMA (Medical Group Management Association) encounter data. The physicians in the group who were scheduling every 30 minutes quickly left the group, either “retiring” or finding another practice where they didn’t need to see more patients than they wanted (like the VA or another government position). I’m thinking every 20 minutes would be borderline for generating enough revenue to cover the clinic costs, unless your systems were really efficient, since every annual exam would be 40 minutes at a minimum. Under “value-based-reimbursement” (capitation) this low productivity could kill the budget. As an example, when I was practicing in the 1980’s and 90’s, most physicians used a 15-minute block schedule. Your re-checks and minor acute condition visits were 15 minutes, annual periodic check ups or very complicated patients got two or three blocks (30-45 minutes). Another common method is the 10 minute method. 10 minutes for simple re-checks (like stable Blood Pressure visits), then you can combine 10 minute blocks depending on the circumstances (e.g., three blocks (30 minutes) for an annual exam, four blocks for complicated patients, etc.). Want to know why we need more doctors? There have been articles recently in the medical literature concerning physician burnout. BURNOUT?? I couldn’t figure out why physicians who are doing 1/8th of what I did and getting paid as well as I was were feeling burnt out! My reflex reaction was that these folks must be wimps! But, a recent article gave me some insight. Firstly, since being a doctor is a job now, not a calling, the doctor’s internal value system is not aligned with what it takes to be a caregiver. The article documents that physicians who consider being a doctor as a “calling” had less burnout that the ones who classified being a doctor as a “job”. Secondly, practicing medicine is not what it used to be from what I call the “wow” factor perspective. When I was a primary care and saw patients across the continuum I saw some and did some pretty amazing things. I did things that got my adrenaline pumping. I actually saved people’s lives in real time, right on the spot. It was like being a gambler with an intermittent unscheduled rewards pattern (Skinnerian theory) that is a strong reinforcer to keep someone doing the same thing (that’s what fuels gambling addictions). It made the hum drum of office work tolerable. Nowadays, the primary care’s don’t see any really sick patients, they don’t do procedures, they don’t pull someone out of the grave to live years longer. It’s day after day of preventive care and chronic care management. Actually, an APC can do at least 70% of what a physician does in primary care now. They are essentially tweaking care plans and medication doses against a guideline and doing counseling. So, if it is just a job and it is relatively rote (following chronic care and preventative care guidelines), I can see why these folks get burnt out. To me, Borrring! That’s why I ended up in Urgent Care. Not as intense as ED but plenty of surprises and acutely ill patients requiring quick, high intensity action!! But, hey, that’s just me! 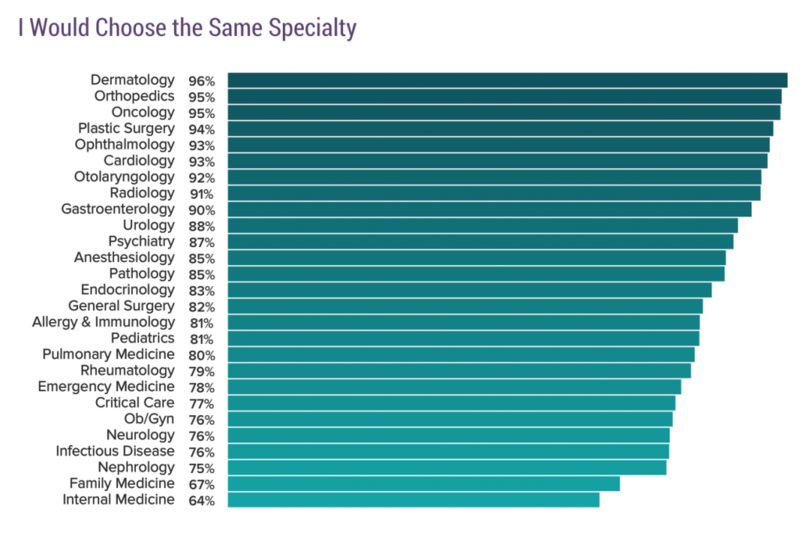 Here’s some data about being a physician is now perceived by physicians as being more about it being a job than a calling. This data is from the 2017 Medscape physician survey. 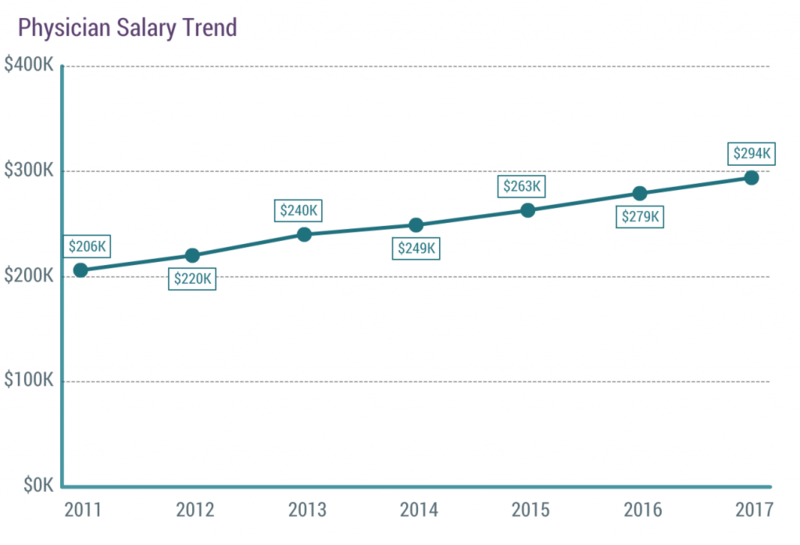 In six years, the average salary went up 50%. That’s about an 8% increase a year. Anyone reading this (besides a physician) getting an 8% a year raise? Eighty-three percent work 55 hours a week or less. Sixty-four percent work less than 45 hours per week. 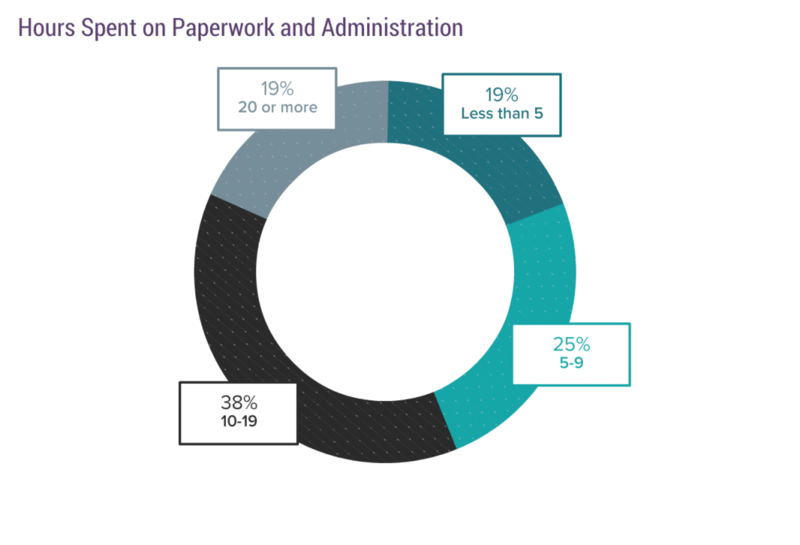 Fifty-seven percent spend 10-20 hours on paperwork. Subtract that from the 45 hours or less hours worked per week (64% of physicians) and you get 25-35 hours a week or less on direct patient care. 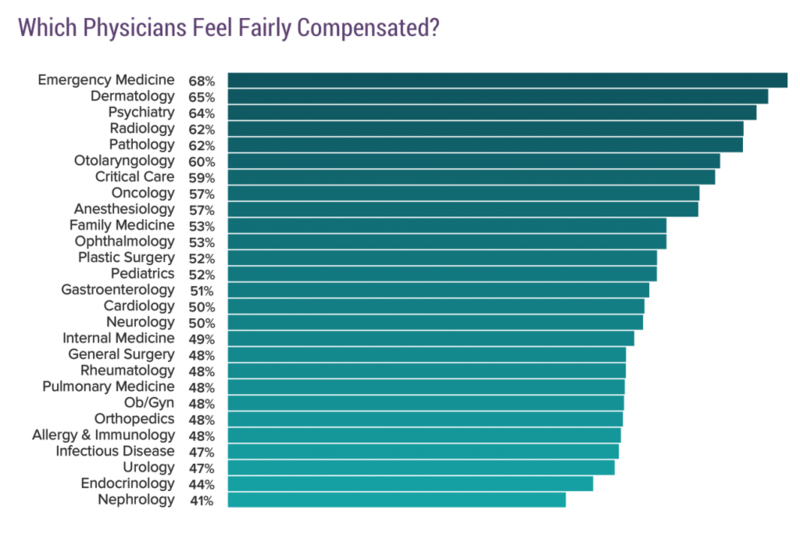 Here’s, by specialty, how they feel about their compensation. For 55 hours or less a week, with an 8% raise a year. So, first question is, how much do you make and how many hours a week do you work? Notice how physician centric these rewards are. “Gratitude” from patients (egotistical?). Being good at what I do (self-serving?). Making good money (great job!) Knowing I’m making the world a better place (a little magnanimous, don’t you think?) Being proud of being a doctor (egotistical?). See anything in there about serving others? How about caring for patients? Nope, all are self-centered. This list is just as self-centered as the rewards. Having to deal with rules and regulations is number one, not something like coordinating care for my patients. Having to work longer hours for less money. Really? They work 1/3 less hours than I did and they are getting 8% raises a year. Whining? Dealing with difficult patients (oh, poor me! ), instead of dealing with the complicated and fractured health care system to get patients what they need. 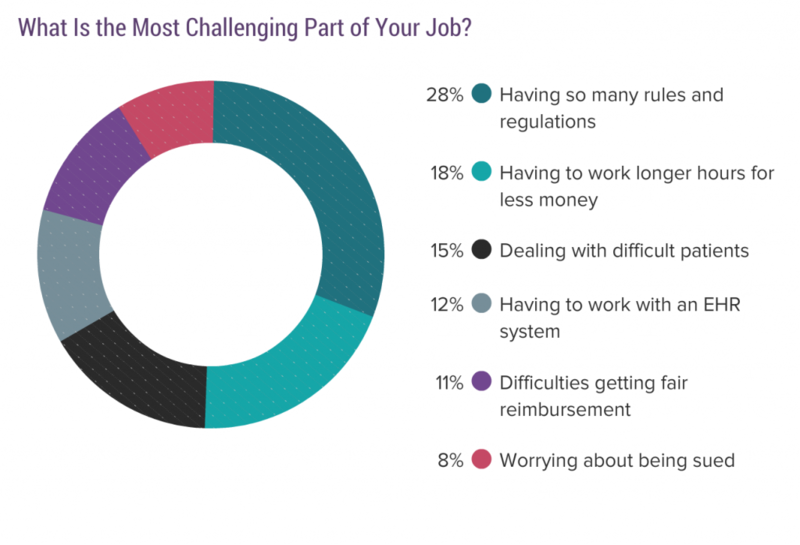 Difficulty getting fair reimbursement (while getting an 8% raise a year). Worrying about being sued (self-centered) instead of worrying that my uninsured or underinsured patients can’t get the care they need because they can’t afford it. Notice where those PCPs are. One-third are disgruntled. 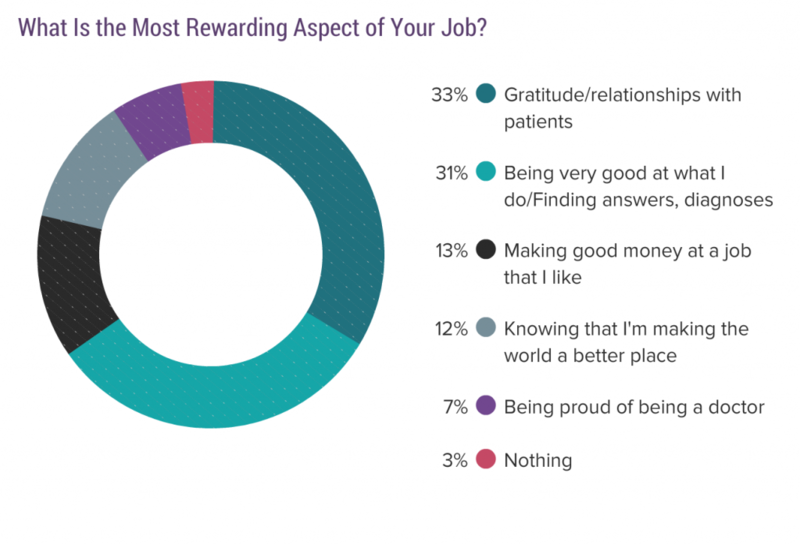 This transfers to how physicians interact and relate to patients and how well of a “job” they do. I bet you’ve run into those physicians. It’s a known fact that disgruntled “employees” leads to lower patient satisfaction and employee productivity. Physicians aren’t different in that regard. Summary of what I got out of this: It’s all about “me” and it’s all about the money. Physicians first fractured the health care system and then backed out of putting in the time needed to care for the population and complain about their “plight”. Double whammy for patients! Physicians put their lifestyles ahead of patients or work. Being a physician to a current physician is more of a job than a calling. Current physicians do everything they can to avoid “being overwhelmed” and minimize the number of patients they see through schedule manipulations, deferring patients to others, and being part time. Physicians’ behaviors exacerbate the “physician shortage” problem. There’s a difference between bodies graduating from medical training and the actual number of FTE (one FTE = a person working 40 hours a week) in the “workforce”. It’s the FTE’s that count. 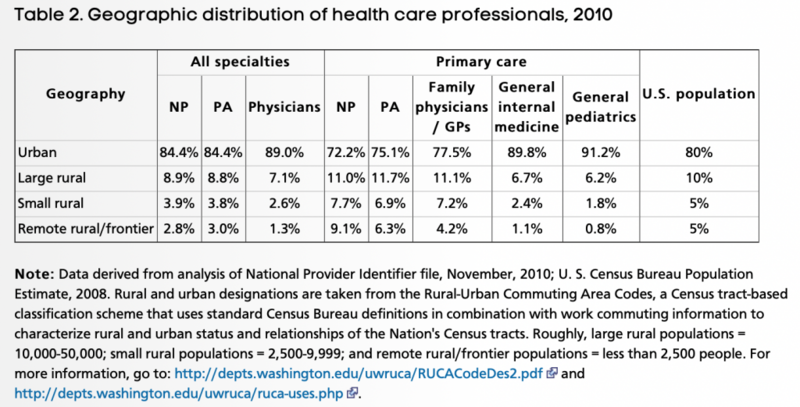 The thing is, you can find many articles and projections and you hear on the news all the time that the US needs more doctors and advanced practice clinicians (APC) (combined to be referred to as “Providers”). I’m going to expand on why this dichotomy in thinking exists. The main reason being that the supporters of more Providers is they completely lack knowledge into what are the drivers of their conclusion that are not going to be solved by just adding more Providers. Let’s just take Primary Care Providers (PCPs). Why can’t the current number of PCPs take care of 320,000,000 US people? Problem #1: Inefficiency of the US health care system. It’s been well established by efficiency gurus like Joseph Juran that the more inefficient a system or process is, the more people you need to run the system or process to offset the inefficiency. To illustrate this point, here is a fictitious analogy. A burger joint opens. It is the only burger joint for 50 miles. The burgers are good and cost 50 cents each. The critical step in the delivery of burgers to the customer is “grill the burger”. The burger joint has one griddle in the joint and it can only grill four burgers at a time. When the burger joint first opens, there are few customers, everything goes well, people get their burgers in 2-3 minutes. Soon, the word is out that the burgers are really good, and more customers arrive. Due to the limited number of burgers a griddle employee can cook at one time, the wait time for a burger increases to 10-15 minutes. People start to complain. To assuage the customers, the burger joint owner tells the customers every 2 minutes that they will be getting their burger soon, assuming as long as people know they will eventually get their burger, customers will complain less. The burger joint owner then installs another four-patty burger grill and hires another griddle staffer to man the griddle. Because of the cost of the griddle and the new employee, the burger joint owner has to increase the price of the burger by 20%. People grumble but anti up the new price as the wait time goes down to 5 minutes. Again, more and more customers frequent the joint and the wait time increases. The burger joint owner installs two more four-patty griddles and hires two more griddle staffers. The price goes up to $0.90, but the wait time is back down to 5 minutes. Customers are angry about the price increase but, they can’t drive 50 miles to another burger joint and so they simply pay the price. This is how the US health care system works today. Add more people into an inefficient system, replicate that inefficient system in new clinics and hospitals and just up the price because health care is what, in economics, is called an “inelastic product/good”. In economics, this means you can increase the price and the demand will stay relatively the same because people really need it. Gasoline is a similar inelastic product/good. Health care administrators know this fact, so, rather than trying to fix the system, it is more lucrative to build more revenue centers and install the same inefficient processes. Besides, they can just continue their cost plus strategies. People will pay anyway. And besides, the people don’t know that there is a better way to do things. Easy decision for the bean counters. The real solution to the burger joint wait time problem is to rip out the four-patty grill and install a 16-patty griddle manned by one staffer. The price increase would have been only a nickel and the wait time would have stayed at 2-3 minutes. Days and times Providers are available are Provider centric and not in synch with peak demand times or patient preferred times and days. Time spent on inquiry that duplicates or triplicates already documented facts that are readily available. Rooms, like Treatment Rooms, that lie vacant >90% of the time, when they could be used as exam rooms. Not utilizing Nursing staff to do tasks within the scope of their licensure, having Providers do those instead. 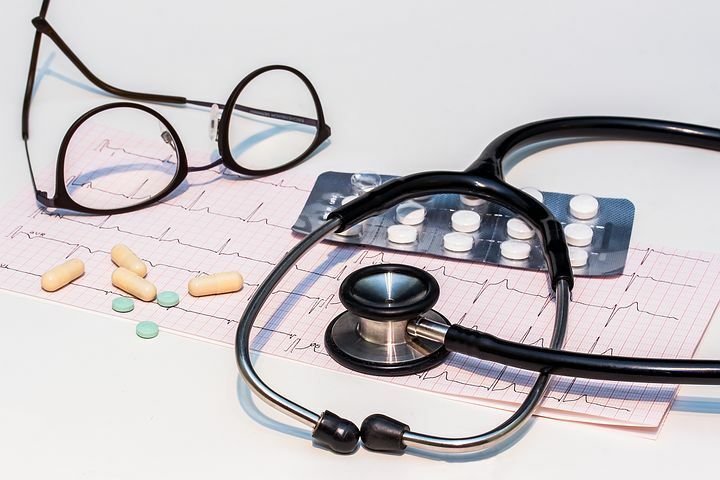 Things like reviewing test results and notifying the patients with normal results or abnormal results after consulting the Provider about the care plan. Not having pre-set-up “kits” for things like laceration repair or pelvic exams so staff don’t have to search and collate the necessary materials. Not having exam rooms set up to provide Providers with what they need with minimal movement. Like, instead of tongue depressors being in a drawer or jar, have a dispenser on the wall next to the oto/ophthalmoscope so that a Provider can reach one without moving from the exam table. Providers refuse to do add-on appointments for their own patients, creating a daily fixed number of patients they will see. This is why Walk-in and “minute-clinics” are doing so well. I’m sure there are more, but I think you’re getting the point. Problem #2: Distribution of PCPs. Problem #3: More Providers are part-time. More than any other time in US history, physicians and APCs are working part time, and their colleagues decline seeing their patients when they are not in the clinics. Patients have to wait. For acute problems they go to Urgent Care. Their skewed access metrics contribute to the idea of Provider shortages. Problem #4: Failure to successfully implement a team model that optimizes the skills, licensure and availability of each team member. There are pockets of these models, but only a few function well, and often the team members are stuck in the same set of issues outlined above in the inefficiency section. Problem #5: Inability to “mass customize”. Health care systems, including PCP offices, try to put all patients in the same “box”. The same time slots, the same rooming procedures, etc. no matter what the patient type or their problem or problems. It’s like everyone having to have the same smartphone with the same apps on it, or the same computer with the same RAM and disk space and features. I’m sure this isn’t all of it, but you see what I mean. Instead of improving the systems that Providers and patients are stuck in, people will advocate for more Providers. We can’t sustain the increase in brick and mortar and people (like the burger joint griddles and staff). It’s time for a major shift in thinking and action. Oops, I forgot, the people running the health care systems are incapable of mustering up that shift. Same ol’ same ol’ persists. The sacred cows are still munching. The leaders are clueless.